Oops - we don't appear to have a video for the ScanJet Enterprise 9000. Boost productivity, improve workflows, and still get the high-quality results you demand with easy and reliable scanning. This A3 sheet-feed scanner can be used as a standalone solution or easily integrates into existing document management systems. Fast and reliable A3 sheet-feed document scanning. 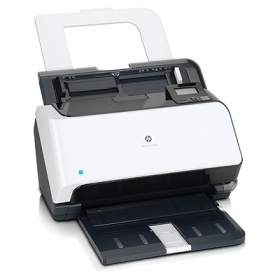 Get fast, reliable sheet-feed document scanning up to A3-size. Complete the job faster with instant lamp warm-up and scanning up to 60 ppm/120 ipm at up to 300 dpi resolution1. Leave stacks of documents to scan with the automatic document feeder. Save time with robust, precise paper handling. Save time and get the high-quality results you demand with HP Precision Feed technologies. Reliably scan large, mixed stacks of various document types at once, including ledgers and plastic ID cards2. Sophisticated scanning at the touch a button. Centralise and simplify scanner management, automate end-to-end document workflows, and reduce support calls to IT. The sophisticated yet easy-to-use software and control panel on this scanner help everyday users quickly scan documents.